Walmart has announced a $2.5 million “Golden Spark” promotion, giving consumers a chance to win “sparks” that will help fund childhood hunger programs in their communities. The promotion is part of the company’s Fighting Hunger Together fall initiative which brings together customers, associates, Feeding America and five of the nation’s largest food companies — ConAgra Foods, General Mills, Kellogg Company, Kraft Foods, and Unilever — to provide meals nationwide. Walmart will randomly award 40 “Golden Sparks” (a $50,000 donation to a backpack program in the community of the winner’s choosing) to participants who enter to win online or via a Facebook app. Additionally, Walmart Associates can compete for their store to win 10 additional “Golden Sparks” totaling $500,000 for their communities by logging the most hunger relief volunteer hours during the life of the campaign. Meal donations can be generated for Feeding America by purchasing select products at Walmart stores and following instructions on the packaging or using a mobile app. In light of our recent webinar, we’re thrilled to see a cause promotion that engages both customers and employees. Walmart provides multiple options for consumers to engage (both purchase-based and not), a plus, and is able to line up major food vendors in a way few other retailers can. Hopefully messaging will be simple and clear so as not to overwhelm customers with so many moving pieces. 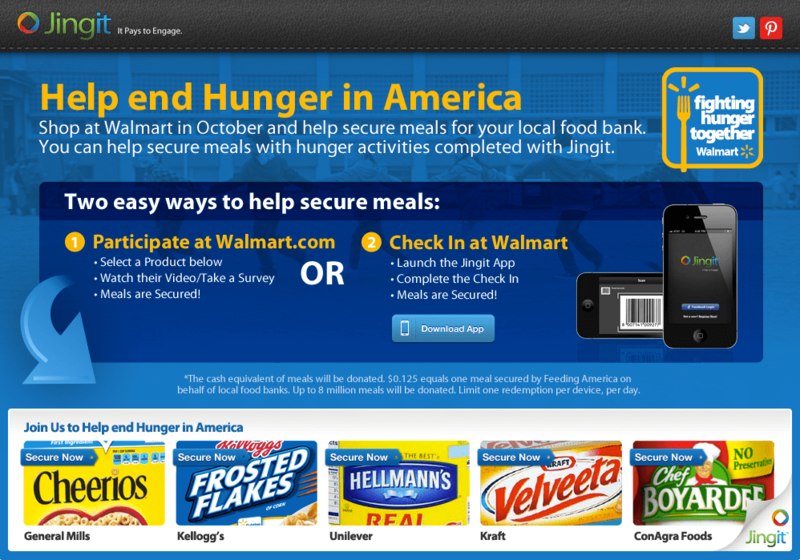 A mobile app called Jingit is required to unlock meal donations, which may be unfamiliar to many consumers. However, as just one small piece of the overall puzzle, it’s unlikely to detrimentally affect the overall promotion.